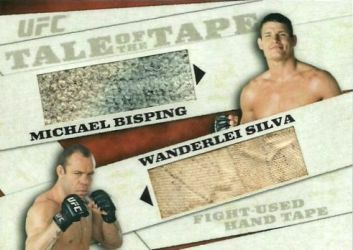 2011 Topps UFC Moment of Truth is gaining praise for being a mid-level MMA release steeped in value. But just because it's not a high-end set doesn't mean that it doesn't have some big hits. 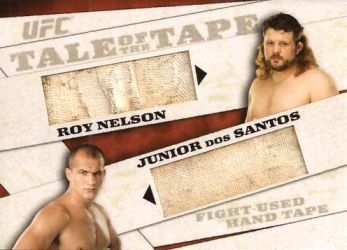 The hottest cards in the set have proven to be the Tale of the Tape Dual Relics and Tale of the Tape Autographed Relics, both of which are highlighted by pieces fight-worn hand tape. 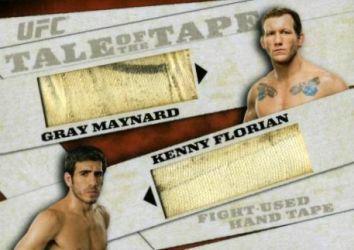 2011 UFC Moment of Truth Tale of the Tape Dual Relics are limited to 25 numbered copies and pair up fight tape from two opponents. 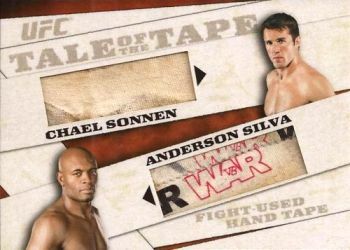 The ten-card checklist includes Chael Sonnen and Anderson Silva, Randy Couture and James Toney, and Michael Bisping and Wanderlei Silva. 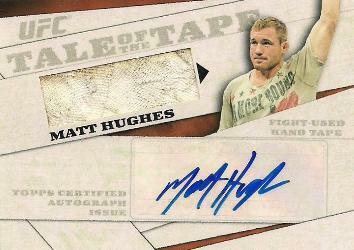 Even tougher to find are the 2011 UFC Moment of Truth Tale of the Tape Autographed Relics. Each of the ten cards in the set are limited to five copies. 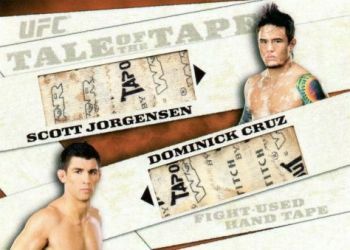 Combining a piece of fight tape with a sticker autograph, the checklist includes Brock Lesnar, Couture and Nate Diaz. 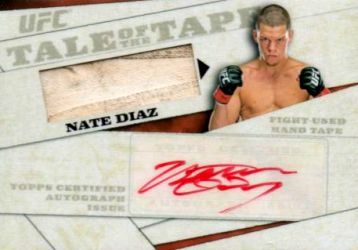 Click here to get a 2011 Topps UFC Moment of Truth Tale of the Tape Autographed Relics checklist. 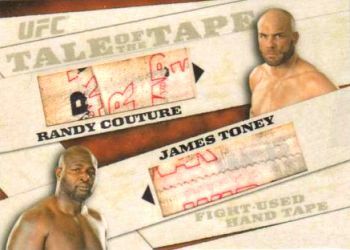 The gritty look of the cards is enhanced by the tape swatches. Many come with the Tapout logo or other branding. Even the plain cream-colored pieces look good as the often show signs of use. Going beyond the standard shorts and shirts used on so may relics, these cards offer something different. That's bound to be a contributing factor in the prices these cards are getting on the secondary market. 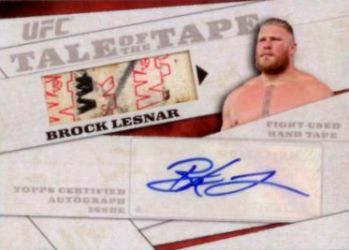 A Brock Lesnar Tale of the Tape Autographed Relic sold for $475 on eBay. 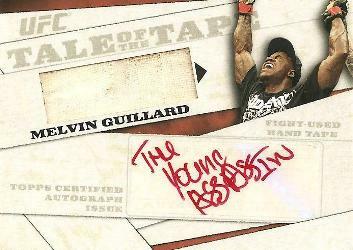 Other autographed cards going for high prices include $386 for Phil Davis, $290 for Jake Shields and $280 for a Melvin Guillard card inscribed, "The Young Assassin." 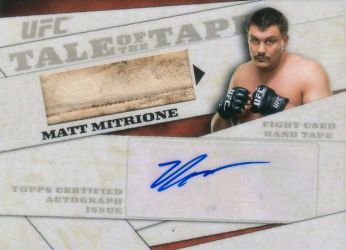 The Tale of the Tape Dual Relics have also seen strong returns. Among the highlights are $200 for a Sonnen/Silva, $185 for a Bisping/Silva and $120 for a Clay Guida/Takanori Gomi card. 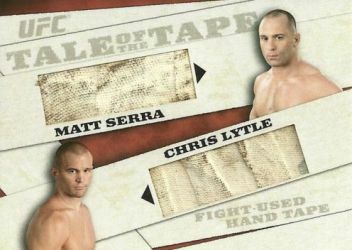 The lowest a dual relic has sold for is $70 for a Matt Serra/Chris Lytle. 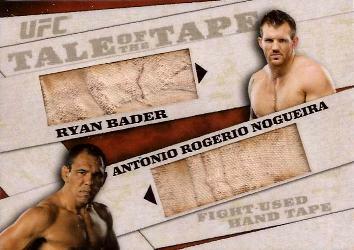 Click here to get a 2011 Topps UFC Moment of Truth Tale of the Tape Dual Relics checklist.